Haile Plantation, an unincorporated community and New Urbanism planned development, is a 2,600 household (1,700 acre) development of regional impact southwest of the city of Gainesville, within Alachua County, Florida, United States. While the Village Center provides the life of the community, most residents reside within easy walking distance in one of two associations: Haile Plantation Homeowners’ Association and Haile Plantation West Homeowners’ Association. The award-winning Haile Village Center is a traditional neighborhood center within the development. 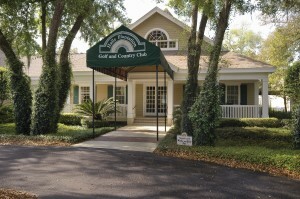 Residents and business in Haile Plantation use Gainesville, Florida for mailing addresses. The development’s name sake is Thomas Evans Haile, a South Carolina Sea Island Cotton grower that established his plantation here in 1854. Enslaved Africans lived on and worked the land. The Haile family ancestors include some who served in the American Revolutionary War. The Historic Haile Homestead, known as Kanapaha, still stands and was featured in the 1979 movie “Gal Young ‘Un”, based on a Marjorie Kinnan Rawlings story. New construction at Haile Plantation started in the late 1970s. 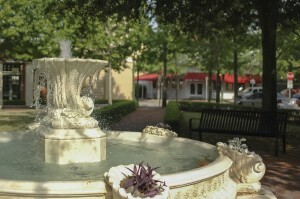 In the early years the first neighborhoods included Laurel Park, Heritage Green, Quail Court and Magnolia Walk. At this time in Haile Plantation, the future village center was a recreational vehicle storage area and a plant nursery staging area. Haile Plantation is still being built out, but now contains over 9 miles (14 km) of roadways and four main roads (Haile Blvd., 91st St., 44th Av., and 104th Tr.). On July 14, 2005, a new shopping center, the “Publix Market Square/Haile Village North” opened at the north end of Haile Plantation. Publix Market Square currently includes a Publix supermarket and several other shops and restaurants. 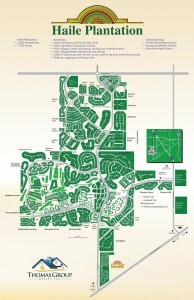 In addition, a private 18-hole golf course and a clay court tennis facility are located within Haile Plantation. Celebrity residents of Haile Plantation include current basketball head coach Billy Donovan. Haile Plantation’s unique circular “lap-like” road layout provide an excellent environment for cyclists to train on, devoid of the usually heavy traffic flow of most public roads.